A study by the National Association of Realtors reveals that a large number of house hunters in the Millennial age range purchased a previously owned home that requires some kind of repair work. If it’s safe to assume that Millennials love fixer-upper homes. November 29, 2018 - A study by the National Association of Realtors reveals that a large number of house hunters in the Millennial age range purchased a previously owned home that requires some kind of repair work. If it’s safe to assume that Millennials love fixer-upper homes based on that study, it’s also a good time to discuss FHA home loan options in this area. Some sources report that a large amount of do-it-yourself projects on the home are designed to add “curb appeal”; other uses of fixer-upper project money include adding specific design or decor features like the ones seen in favorite Pinterest posts. Some are going for more greenery on the lawn or adding hanging plants, hydrangea features, etc. 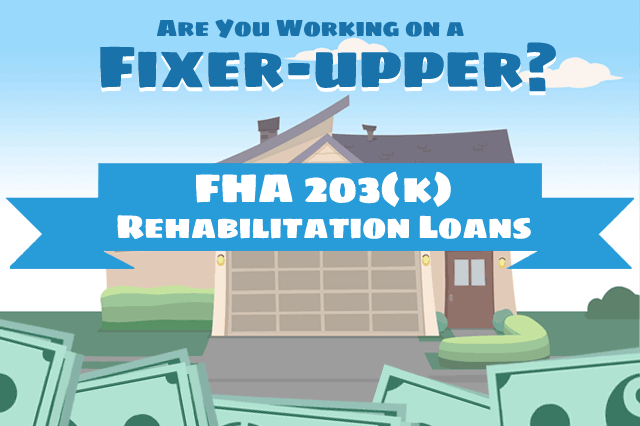 What FHA loans could help people buy or renovate a fixer-upper property? The FHA 203(k) rehab loan is designed to help a borrower buy and improve a property with approved projects. There are two versions of this mortgage-one for large projects that may involve major structural work (or not) and a smaller 203(k) known as an FHA Limited 203(k) that can be used for smaller work that does not require a full 203(k) to finance. The Limited 203(k) has no minimum, but the maximum project cost cannot exceed $35,000. The standard 203(k) has a minimum cost of $5,000. The 203(k) can be used as a new purchase loan or a refinance loan. Why An FHA Rehab Loan and Not a New Purchase FHA 203(b) Mortgage? Quite simply, the house you buy with an FHA 203(b) forward mortgage (which is the “standard” FHA loan for home buyers) must pass the FHA appraisal process as a condition of loan approval; the appraisal may recommend repairs or corrections which must be made in order for the loan to close. For FHA 203(k) Rehab loans, it’s understood that the house will not be in an acceptable condition when it is purchased. However, it must be brought into compliance with FHA minimum standards and state/local building code as a condition of loan approval over a timeline agreed upon between borrower and lender. Normally the corrections and renovations must be made within the agreed-upon time frame as a condition of loan approval. The difference between the 203(b) standard mortgage and the FHA rehab loan? The borrower already owns the house when the renovation work begins and that work is paid for out of escrow. With a typical forward mortgage, any required repairs or corrections would take place before the borrower is allowed to close the deal and take ownership of the property. Talk to a loan officer to discuss your needs for an FHA rehabilitation loan based on the size of the project you want to do and the type of property you wish to buy.